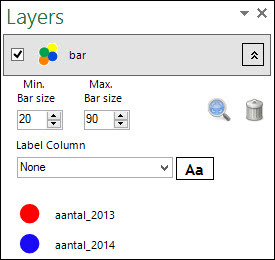 Excel E-maps has a new bar chart or column bar graph function. The bar chart has vertical rectangular bars with lengths proportional to the values that they represent. The size, color and transparancy can be adjusted. Visualize your data with piecharts . We revealed our feature for current and new customers. All new and current customers will receive the feature automatically when updating or ordering E-Maps in September. 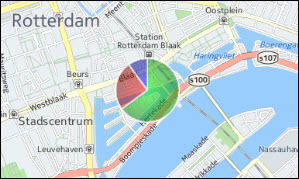 The colour and size of the piecharts can be adjusted. Import your own map in SHAPE format on top of the background map and get even better looking maps. If you have a vector map in SHAPE format (extension shp), you may import the map. E-Maps is designed to work with WGS84 format (other projections may work). The base files for the map should have a project file (extension .prj) too. See the tutorial how to import the map. Vector maps can be coloured or used for thematic shading. 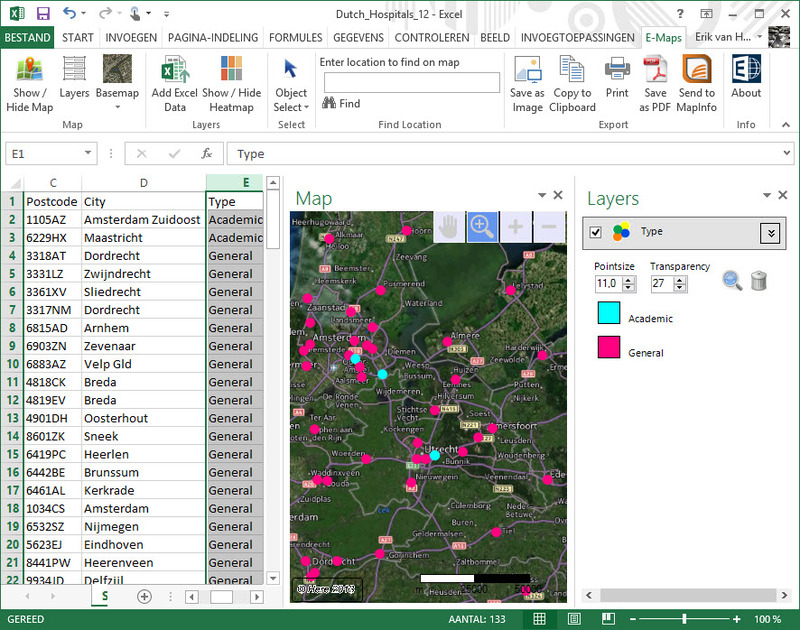 The new labels in Excel E-Maps are controlled from the layer menu. The style and column can be changed. The label has a Halo style for good visability and is placed right of the point. 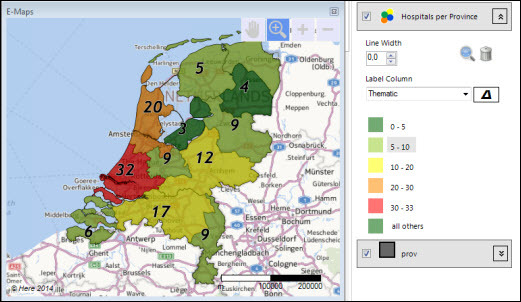 We developed a script to show your colleagues how to create a map in 45 seconds. 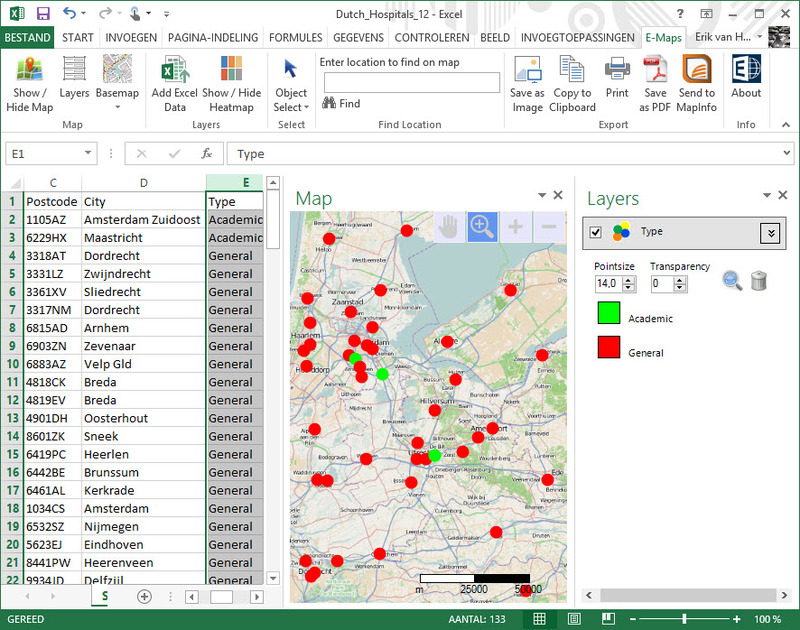 Click another row in your Excel sheet and see the map zoom to the selected point. User adaptable colour and point size.